Created at the Arctic-news blog end 2012 as a page featuring images with clickable links (hover over images), to complement the Comprehensive Plan of Action written and advocated by Sam Carana at various blogs. A Comprehensive Plan of Action on Climate Change needs to include policies to achieve a sustainable economy, as well as adaptation policies. Such a comprehensive plan is best endorsed globally, e.g. through an international agreement building on the Kyoto Protocol and the Montreal Accord. At the same time, the specific policies are best decided and implemented locally, e.g. by insisting that each nation reduces its CO2 emissions by a set annual percentage, and additionally removes a set annual amount of CO2 from the atmosphere and the oceans, followed by sequestration, proportionally to its current emissions. Policy goals are most effectively achieved when policies are implemented locally and independently, with separate policies each addressing a specific shift that is needed in order to reach agreed targets. Each nation can work out what policies best fit their circumstances, as long as they each independently achieve agreed targets. Cuts in CO2 emissions of 80% by 2020 can be achieved by implementing local policies focusing on specific sectors (such as energy production, transport, land use, waste, forestry, buildings, etc). As an example, each nation could add fees on jetfuel. Where an airplane lands that comes from a nation that has failed to add sufficient fees, the nation where the airplane lands could impose supplementary fees and use the revenues to support methods that capture CO2 directly from ambient air. Such supplementary fees should be allowed to be imposed under international trade rules. 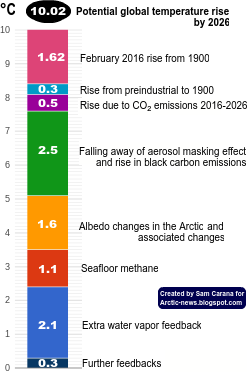 Some policies will need to continue beyond 2020, in order to bring down levels of greenhouse gases in the atmosphere to their pre-industrial levels this century, i.e. getting CO2 in the atmosphere back to 280ppm, CH4 back to 700ppb and N2O back to 270ppb. Policies can be very effective when focusing on local sectors such as agriculture and buildings, while also supporting geo-engineering methods such as biochar, enhanced weathering and direct capture of carbon from ambient air. 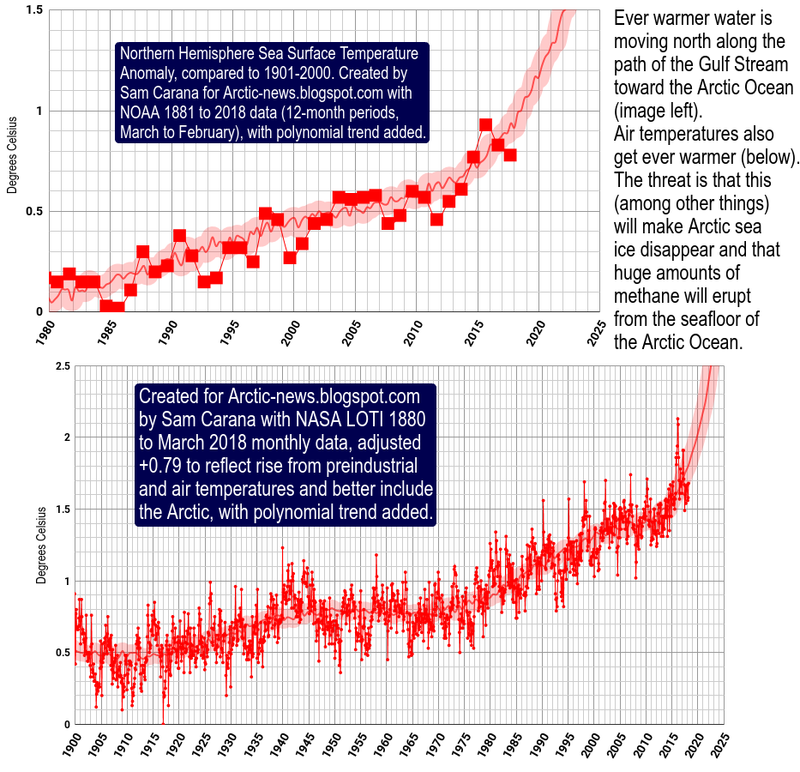 In addition, further geo-engineering methods will be needed to avoid runaway warming. 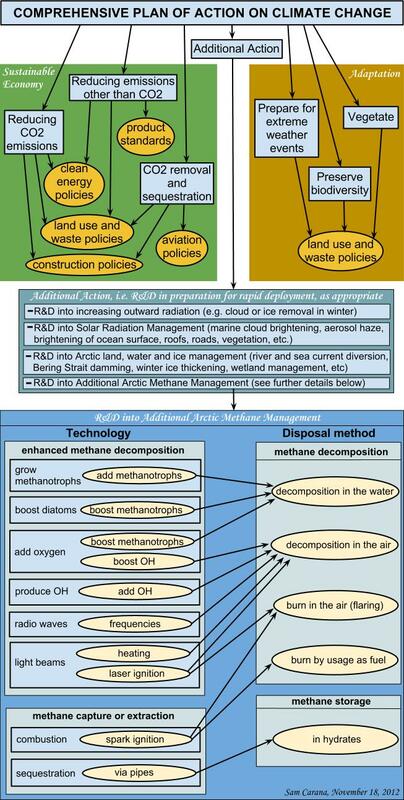 This is illustrated by the image below, which highlights the need for geo-engineering methods that focus on methane, a component of the plan that needs to be given far more attention. Again, support for such methods could be agreed to proportionally to each nation's current emissions. Some of the areas below can be clicked on for examples or more background.